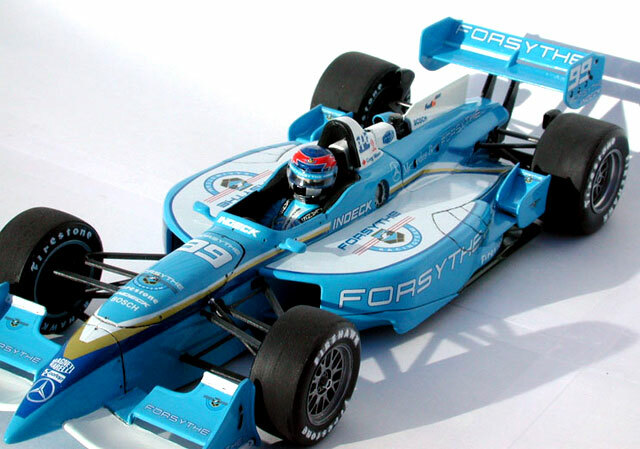 This is the Players version of the Revell Reynard kit in 1/25. 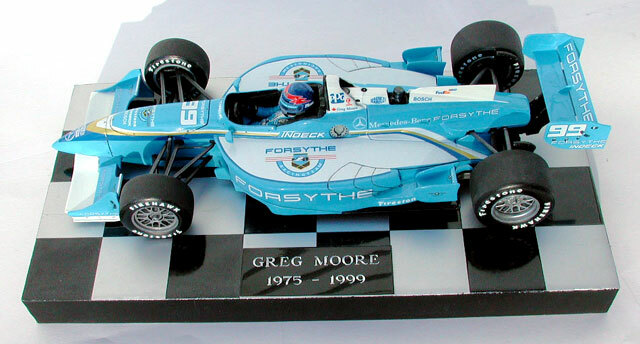 When I bought this kit I was planning to do Patrick Carpentier’s car, but I decided to build his teammate Greg Moore’s car to pay tribute to his great talent following his tragic death. 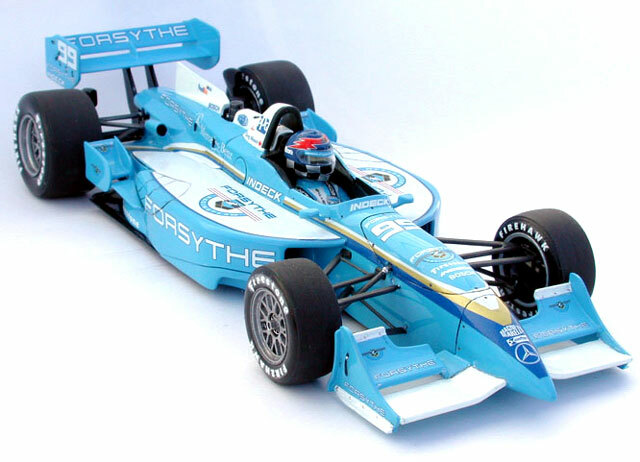 The kit is molded in white plastic. The recessed lines are quite wide but I didn’t want to fill and and rescribe. My first chore was to dry fit everything. This step paid off because the top and bottom halves of the tub did not fit very well, and the nose aileron curve did not match the tub’s curve. To correct this problem I had to chop off the front bottom suspension arms that are molded with the bottom tub to be able to assemble the tub and apply putty. This simplified the paint process too. The engine cover was then cut off the top tub in order to permit assembly of the tub before paint, because all the rear suspension arms are hidden under the cover after assembly. The figure was pretty simple to paint and assemble. The only issue was the helmet visor. It did not fit the helmet at all and was way too thick, so I replaced it with a piece of acetate. 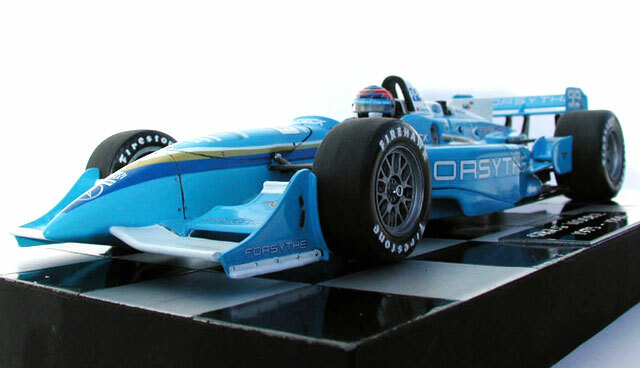 This is the only item on the model that was not sourced straight from the, other than the Slixx carbon fiber decals used on the brake cooling ducts and rear wing posts. 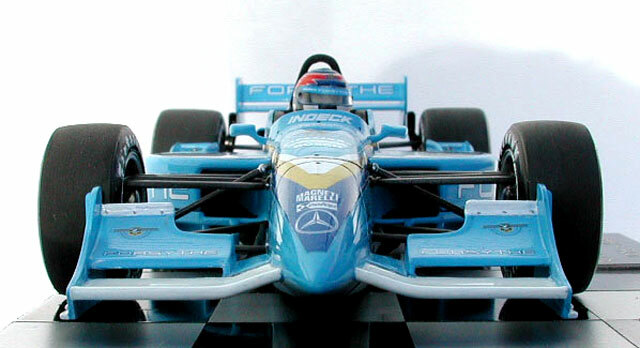 The model was painted using Testor’s Blue #1108. 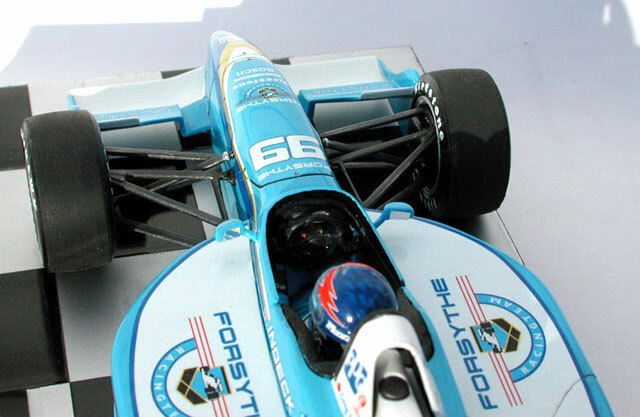 The White on the roll bar, front wing, and engine cover is Model Master’s Classic White. The paint received a top coat of gloss clear acrylic. The wheels were painted using Model Master Aluminum Plate Metalizer, then weathered with a light wash. 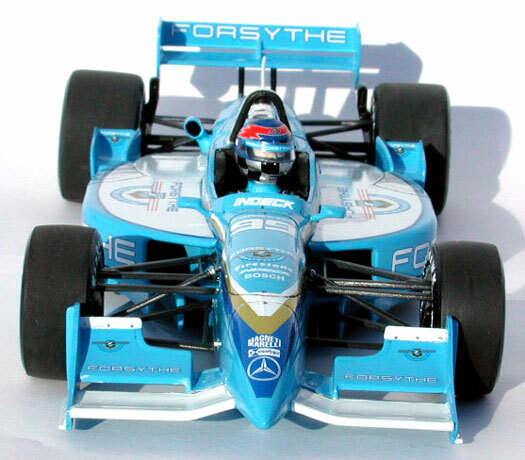 The rear wheels were left shinier to suggest the layer of brake dust on the front wheels. The suspension arms were painted Interior Black and dry brushed with Aluminum Plate Metalizer. Decals are pretty good for Revell, although they required a lot of Micro Sol to settle down. Micro Set had no effect. 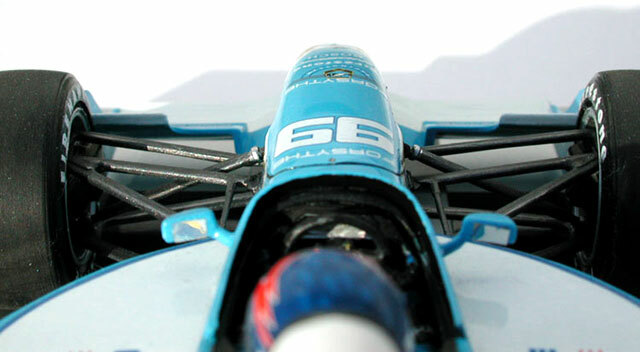 The worst-fitting decal is the one on the nose (blue, gold and white stripe), as shown on the close up picture below. It had to be cut in the middle and overlapped slightly. The large white decals on the side pods have a very good opacity. I forgot to paint the top of the pods white but the decals covered the blue very well. For tire decals, don’t forget to apply a coat or two of gloss clear before you apply the decals on the tires because you might have some silvering problems like I did. Luckily, it does not show too much. Then I applied a generous coat of clear flat acrylic over the tires, which probably helped resolve the silvering. 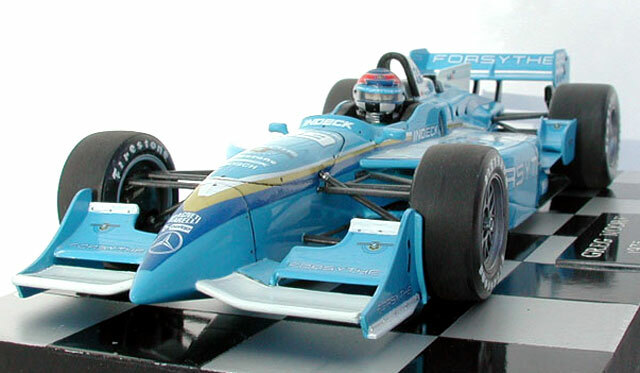 The car looks good with those decals but it would look a lot better with the tobacco decals. Not being an experienced modeler, I found that a lot of planning was needed to deliver a reasonable result. 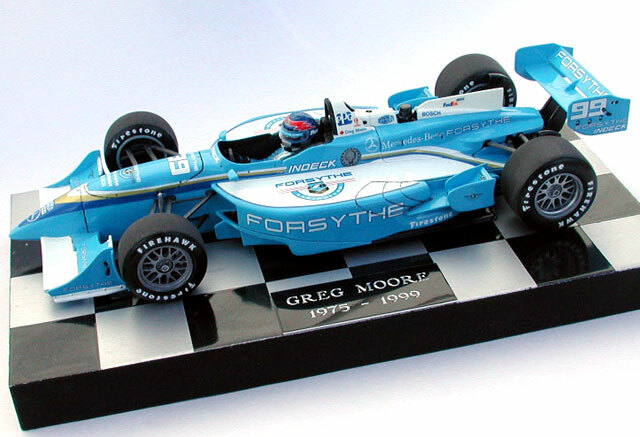 Overall though, I think that it is a pretty nice looking model on the shelf and most of all it will help keep Greg Moore’s memory alive.